Qualcomm’s pricing strategy, too, has won it few friends in recent years. Most contentious is the way in which it licenses its intellectual property to device-makers, charging them a percentage of the total selling price of their devices. Apple alleges that such royalties act as a tax on any innovative features it adds to its products, and is yet another way in which the chipmaker is abusing its market power. Apple is seeking damages of over $1bn from the chipmaker in lawsuits filed both in China and California. Regulators in Taiwan, South Korea and China have already extracted penalties for the licensing model; an investigation by America’s Federal Trade Commission, launched last year, is under way. 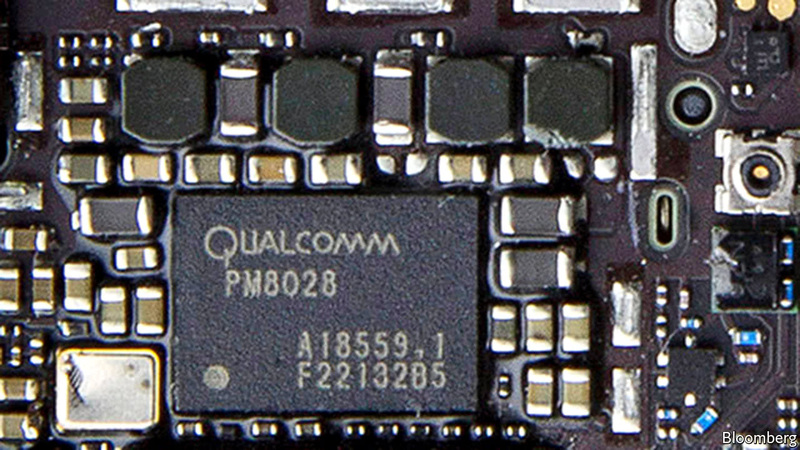 In a rare bit of good news for the chipmaker, regulators in Europe and South Korea last week gave their blessing to Qualcomm’s $47bn acquisition of NXP, another chip-design firm. Qualcomm hopes the purchase will help it to boost its business in 5G chips and the “internet of things”, as connected devices are collectively called. But Ms Vestager is not quite finished with the firm. The commission is yet to rule on whether it also engaged in predatory pricing between 2009 and 2011 by setting the prices of certain chips below cost, allegedly to force a competitor out of the market. Qualcomm is fined for anti-competitive practices—again – A fine habit.